Hi Friends, thanks for your response and comments to my last post in which I share with you why Oriflame is today one of the fastest growing beauty companies selling direct to customers. In todays post because many times people call me and ask 'how to become an Oriflame Consultant?' I will explain how to do it. Actually, becoming an Oriflame consultant is easy. You first need to find an existing consultant who is successful and who can guide you properly. If you dont know anyone who will tell you all the secrets then I am always available on my Facebook page or Google+ or on email or phone. To become Oriflame Agent/ Consultant you just need to fill the application form and pay your joining fees. Full Name, Address, Mobile number, Email id, Date of birth, along with the joining fees. Click here to join Oriflame Cosmetics India. Joining fees is usually 299. But sometimes there is an offer. So just call me and I will let you know the exact offer. I usually give a copy of the current catalogue to new joinees and explain the basics. You can then collect your orders by showing the catalogues to as many friends as you can. By this time your registration will be complete and you will get your consultant code. Finally, you will be able to place your first order and start off with Oriflame. 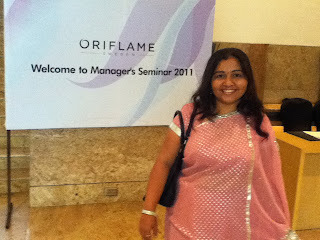 You can then attend all Oriflame meetings and trainings such as Step 1 and Step 2 Training, etc.